Dreyer, copy chief at Random House, presents a splendid book that is part manual, part memoir, and chockfull of suggestions for tightening and clarifying prose. These begin with his first challenge to writers: "Go a week without writing very,' rather,' really,' quite,' and in fact.' " ("Feel free to go the rest of your life without another actually,' " he says.) 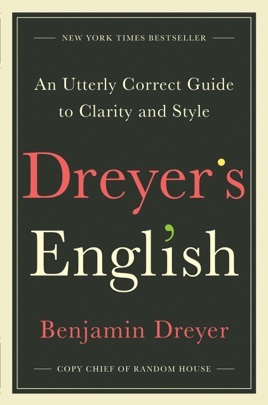 Dreyer goes on to write with authority and humor about commonly confused or misspelled words, punctuation rules, and "trimmables," or redundant phrases (the most memorable he ever encountered was, "He implied without quite saying"; Dreyer was so "delighted" he "scarcely had the heart" to eliminate it from the manuscript). But Dreyer's most effective material comprises his recollections of working with authors, including Richard Russo, who after noticing a maxim posted in Dreyer's office from the New Yorker's Wolcott Gibbs "Try to preserve an author's style if he is an author and has a style" later called him to ask, "Would you say I am an author? Do I have a style?" This work is that rare writing handbook that writers might actually want to read straight through, rather than simply consult. I absolutely adore this. I do. It’s perfectly charming in an unconventional way. I’m both reading the book and listening to the audiobook (also available on iTunes.) Benjamin Dreyer expresses the rules, nonrules, and ettiquette of grammar and language through experiences he has faced as a copyeditor over the years. Rules are explained through experiences and stories. It’s fantastic. I enjoy the narrative that mixes with the lessons as they help me remember what should and should not be said or written. Although, perhaps if Dreyer were to see this review, he would think that my English could use some work. All in all, I find this book highly enjoyable and truly entertaining. Much more than a style manual, it is helpful and hilarious and overly amusing.